Megan Edwards is co-founder of RoadTrip America.com. 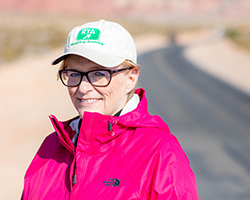 She is the author of Roads from the Ashes, the story of RoadTrip America's evolution from its beginning in a California wildfire. Megan has always been "an idea person." Not all of her ideas are practical or achievable, but many aren't bad, like the idea to put RoadTrip America on the Web back in February, 1996. While she never took a road trip she didn't like, Megan is particularly fond of hitting the road solo every once in a while. "It's a great way to get fresh perspectives, and it always gives my confidence and creativity a huge boost," she says. "If you're feeling stuck, start driving!" Megan is the author of Getting off on Frank Sinatra, Full Service Blonde, and Strings: A Love Story.